Offered at $574,900 - 3.71 Acres with 3.30 Usable Acres for Sale on Lot 1B with approved 40,000 SF Building. 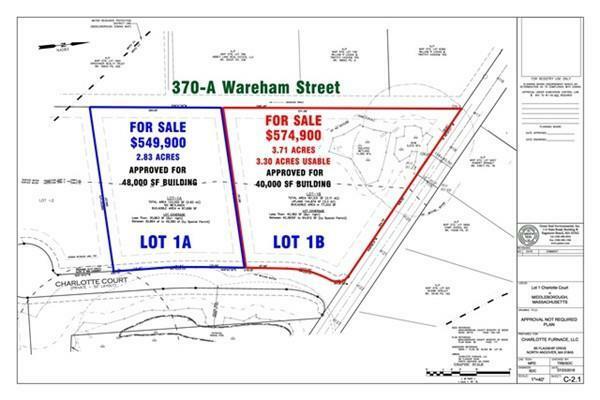 Offered at $549,900 - 2.83 Acres with approved 48,000 SF Building on Lot 1A. Vacant Land with all roads, infrastructure included in sale. Developer will build to suit. Close to Interstate 495/Exit 3. Potential for Marijuana Use. Listing courtesy of Greg Hartel of Hartel Realty. Listing provided courtesy of Greg Hartel of Hartel Realty.